Tom Sachs' studio team navigates Mars landscape in Mars Roving Vehicle. NEW YORK — Step into the Park Avenue Armory here and you might think you're on Mars, or at least looking at the NASA gear meant to go to the Red Planet. Look closer, though, and you'll notice duct tape, plywood and plastic in places where you'd expect titanium and Teflon. 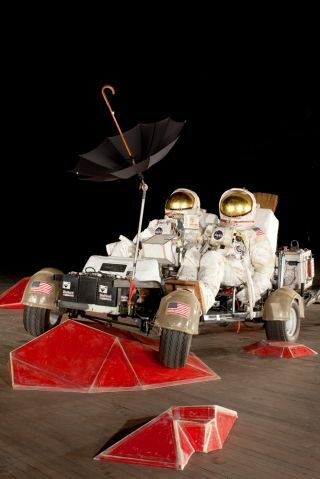 The scene is "Space Program: Mars," an exhibition by sculptor Tom Sachs that creates an envisioned Mars expedition, complete with landing module, rover, and Mission Control. The show opened May 16 and is on view through June 17, so those in the area who want to see it should act fast. Along with the installations, the exhibition has staged special presentations, lectures and events to build on its theme. The last presentation is planned for 12 p.m. EDT on Saturday (June 16). Mary Eannarino performs mission tasks in preparation for "Space Program: Mars." "Tom Sachs is a really wonderful artist and he had this dream of creating his own space program, in part because he wanted us to take a look at where we've come from and who we are today and what are the values and beliefs that we have today that are going to influence the space program of the future," said Anne Pasternak, a co-curator of the exhibition and president and artistic director of Creative Time, which co-produced the show. The exhibits in "Space Program: Mars" range from realistic reproductions to imaginative predictions infused with irreverence. A biology lab that appears to be growing food crops is actually growing opium poppies. Pop culture icons such as the symbol for The Artist Formerly Known as Prince and characters from Star Wars are interspersed with authentic NASA logos and scientific jargon. "We hope that it gets people to think about the values of the space program and the reasons why we're exploring space," Pasternak told SPACE.com. "While on the one hand it celebrates that creativity and vision and international cooperation that it takes to get to space, it's also asking fundamental questions about the ethics of exploring another planet." The show's dual intents as homage and provocateur to the space program are evident in its central installation, a walk-in Landing Excursion Module based on the Apollo lunar lander. From a distance, the LEM looks like the real thing, each spidery leg and cornered surface perfectly in place. But when visitors step inside, they see conspicuous breaks from history in the rows of Stolichnaya vodka and Jack Daniels whiskey (not to mention a squirt gun of tequila). "This is one of the fundamental differences between our space program and the other NASA," said Robert Dimin, official LEM educator at the exhibition. "They wouldn’t have had a fully functioning liquor cabinet or bar aboard the ship. We have that so our astronauts can enjoy themselves on their journey to Mars, but also to discuss the historical moment of the cold war. Had the Cold War not happened, Tom acknowledges that we may not have pushed space and science as far as we have and landed on the surface of the moon. So we use the vodka to represent the Russians, and the Jack Daniels to represent the Americans." Installation view of the Landing Excursion Module (LEM), Mars Excursion Roving Vehicle (MERV), and Tom Sachs on WAR Bike in "Space Program: Mars." The gallery is staffed by artists called "Grummans" who carry out work in the stations, repairing spacesuits or maintaining experiments. For some, acting out the role of space traveler has left a distinct impression. "It's really opened my eyes to a lot of the developments that are happening with NASA, which is kind of in a limbo state right now as far as pushing things forward to actually go to Mars," said Mary Eannarino, who performs as an astronaut in the exhibition. "And it's made me think a lot about how back on Earth it's important to explore what we already have here." In some cases, real life spaceflight has met facsimile in the exhibition. Last week, former NASA astronaut and second man on the moon Buzz Aldrin visited "Space Program: Mars" and toured the gallery with Sachs. "He was really very receptive in a very positive way," Dimin said of the space pioneer. "He was just kind of all smiles and laughs and very appreciative of what we were doing." For more info on "Space Program: Mars," visit the official website here.